Marriage outright into the smart set is far and away the surest method of effecting an entrance into it; few visiting lists, for example, having undergone a more radical change than that of Mrs. Drexel-Dahlgren since her marriage to Mr. Harry Lehr. Another expeditious method is by means of a business deal, benefiting one or more members of the smart set—not a hard cash bargaining for social promotion, although men have been known to form business partnerships for this express object; but, to illustrate—a short time ago a railroad transaction secured admission for a family into an influential section of the “magic circle.” There are delicate ways of conveying the expression of one’s social needs, and the ultra-smart are endowed with a fine sense of noblesse oblige, provided one is manipulating events so as to fill their purses. If you are socially ambitious, do not set up your domicile on the upper West Side, but fix your abode as near as possible to “Millionaires’ Row,” the Fifth Avenue court end of Central Park—not necessarily an unduly ostentatious house which will egg everyone on to asking the dread question, “Who is who?” but letting the show-place come a few years later, after you are well placed socially. A grandiose house on a conspicuous thoroughfare, with no suitable guests to fill it, like the gigantic edifices of the Bank of Italy and Ministry of Finance in Rome, is an exclamation point strongly provocative of irony. A particular phase of newspaper publicity to fight shy of is that involved in allowing the women of your family to become enrolled as members of certain clubs and charities, and having their names bundled out in the third-class society column of a certain Sunday paper with lists of “detrimentals” of the first water, numbers of them turning out to be veritable mill-stones hung about the neck of social aspiration. A woman of fashion and a clubwoman are two mutually excluding entities—two totally distinct creations of Almighty God, although the latter often tries to palm herself off as the former. The next move for the social aspirant will be to cultivate the acquaintance of some fashionable woman whose finances are on the wane, but whose temperament requires the expenditure of large sums of money, and who is, moreover, a walking American Debrett and Burke, in short, a running commentary as to knowing who are the people one can receive. Form the acquaintance of an occasional visiting nobleman, if fully assured he is not an imposter, and that he is received by persons who might be made, possibly, to fall in line some way for furthering your campaigns. Minister well to his gastronomic needs, for in all probability, he has taken lodgings sans meals. But avoid making yourself unduly conspicuous in public print with these people of title, for should any one of them turn out to be a scapegrace, the satirical periodicals will show you up as a nobody caught in the flagrante delicto of snobbishness and hanging on by the eyebrows. If, on the other hand, a titled European is comfortably wealthy and persona grata at the houses of the highest fashion, do not waste much time and effort over him, for in all probability he will front you as soon as he has ascertained your exact social status. With reference to your own countrymen all along, give a wide berth to certain soi disant society folk of the upper West Side, who will get your name in the newspapers morning, noon and night and three times on Sunday, until it becomes case-hardened on the lists of the socially impossible. And, above all, be philanthropic with your purse, although, perchance, the heart responds but feebly. Conditions have changed a good deal since William D. Howells wrote his “Traveler in Altruria,” and fashionable charities as an adjuvant to social climbing are growing more difficult to be worked, and the Church still more intractable for these ends; but there is a dernier ressort; join the Countess Leary‘s charities. Do not, I beg of you, make a national one night stand theatre comique of yourself and family by making the grand tour of hiring cottages at Newport, Lenox and the other ultra-smart resorts before society has given the slightest recognition to your claims. Invoke the aid of old Father Neptune; secure a yacht, as sumptuous a one as you please, and, socially speaking, if your bark sink, ’tis to another sea. If ignored or snubbed at Newport, spread sail for Narragansett Pier or Bar Harbor, felicitating yourself that the social thud is not barbed with the added poignancy of one’s having been a cottager in a place and not being received. Besides, there is no more acceptable way of entertaining and of putting people under heavy social obligations to one than by giving yachting parties. Go abroad early and stay late, in the London season, stopping at the Carlton or at Claridge’s, at all events, dining and supping frequently at the Carlton. Secure the services of a high-class social promoter; such a person can be corralled by judicious advertising from the ranks of the nobility for a sufficient price. Only a short time ago an English woman, backed by an eminent peeress, guaranteed to several Americans court presentations to Edward himself at five thousand dollars a head! 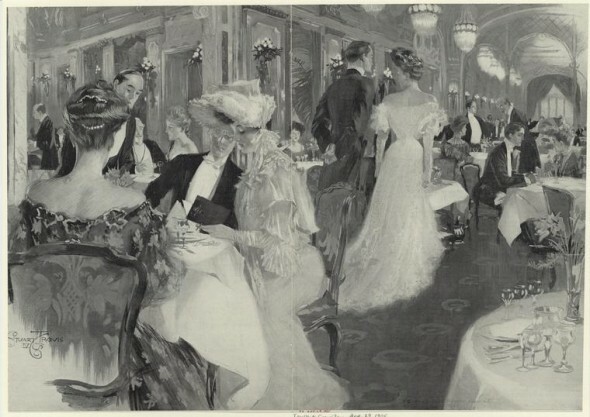 Arrange with the promoter to have a dinner given in your name at the Carlton in honor of a distinguished peer or peeress, with covers laid for no other Americans besides yourselves, and see that the event is given the widest possible exploiting on both sides of the Atlantic. If, during your European sojourns, you fall in with fashionable Americans, try, by delicate and becoming advances, to ingratiate yourself with them, leaving it entirely to them, however, to take the initiative of keeping up the acquaintance on American soil. Strenuously avoid even the semblance of future building upon them, or banking on the name after your return home. Should it finally be your good fortune to receive an invitation to the church for a wedding in a really fashionable family, for which invitations have been sent out by the thousands, make a costly and artistic present. More than likely it will receive mention in the newspapers through the kind offices of society reporters, whom your husband has treated to champagne galore, and one or two of whom have perhaps shown their gallantry by inserting your name in their columns among lists of guests at smart entertainments, at which you were neither present in the body nor honored with an invitation. At all events, the general public, which is hot-headed, upon reading of your extravagant wedding gift, will jump to the conclusion that you were, of course, bidden to the reception. Provided the marriage is not altogether a cold-blooded one of convenience, a feeling toward yourself closely simulating gratitude may well up in the hearts of the bride and her family. This clever little stratagem was resorted to by an aspiring family of wealthy Newport cottagers invited to the church for the Oelrichs-Martin wedding, and to this day is yielding a good bonus in social returns. Yachting parties! A sure way to social advancement, but one must first become a member of the best (read oldest) yacht club. This in itself can be a major challenge to the aspirations of the socially ambitious. @Henry: So true! But these social-climbers could still drop anchor at Newport and hope the snobbish enclave would notice them. This was fascinating. I was especially taken by the phrase that said, “There are delicate ways of conveying the expression of one’s social needs….” How true that is of any age, although met through different means. I’m just a middle class American and I’ve had to navigate these waters just to find friends that I really like, not for purposes of gaining social influence or self-aggrandisement, just for the comfort of having a “bosom friend” as Anne of Green Gables would say. I really enjoyed this article! I’d never have imagined that the social elite had so many dos and don’ts as this article detailed!